With the 3DS launching later this month in Japan, retailers are starting to get 3DS dummy cases for in-store displays. And the 3DS cases...they're different. 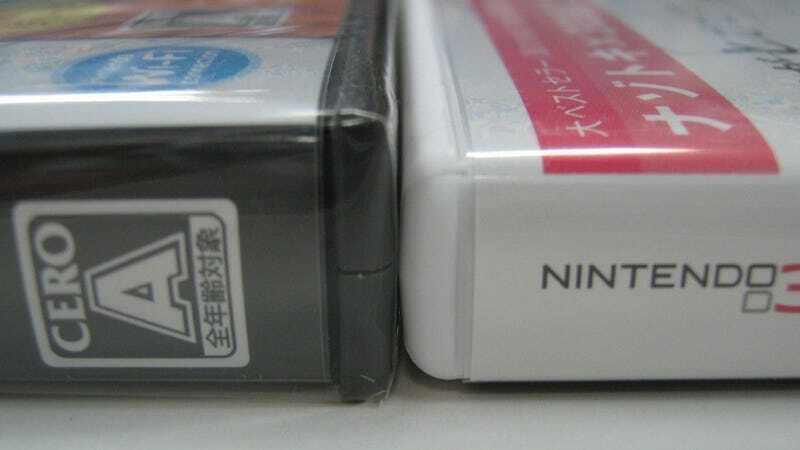 Compared to the regular black Nintendo DS cases, the 3DS ones are white. The logo placement has changed, too. That's not all, the 3DS cases are slimmer and apparently weigh 15 percent less than the Nintendo DS cases. The reason for the lighter cases is the 3DS casing's low cost and green design: Nintendo 3DS cases are filled with holes, which should make them more environmentally friendly. Supposedly, the 3DS cases are slightly harder harder to open and close when compared to the Nintendo DS cases — no biggie, though! The Nintendo 3DS goes on sale later this month in Japan and in the West in March.